Hawaii is one of the most idyllic vacation destinations in the world. Millions of people fly to Hawaii to enjoy the arresting volcanic landscape, hospitable locals, and fascinating culture. There are six main islands and several smaller islands. Each island has its own unique character, but all of them offer plenty of opportunities to try water sports. The best time to visit Hawaii is during the dry season, between May and October, but it can be hot and sticky. If you travel during the wet season, bring some wet weather clothing, as sudden downpours are common. Book your accommodation well in advance, especially if you want to visit Hawaii over a major holiday period. There is no shortage of accommodation choices, from resort hotels to luxury Hawaiian rentals to suit the more discerning traveler. Bear in mind that you will have more room for your sports gear if you rent a luxury villa. Here is a quick guide to some of the best water sports on offer in Hawaii. Hawaii is the birthplace of surfing and Duke Kahanamoku, a former Hawaiian beach boy, won several Olympic gold medals in the sport. There really is no better place if you want to be at one with the ocean. Oahu is the most popular island for surfers. Head to Waimea Bay and Sunset Beach on the north shore or Makaha on the west shore. 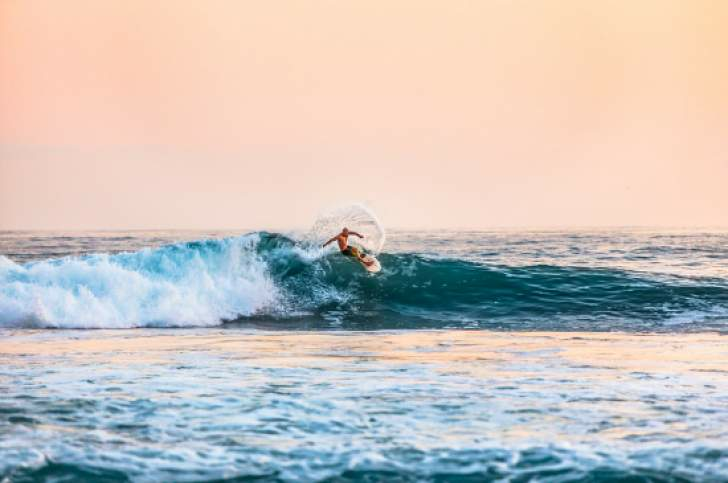 The best time for surfers to visit Hawaii is between November and January, as this when the surf is up and thousands of people flock to Oahu's North Shore to catch the best waves. Visit Oahu in November/December and you can catch the pros at work. Several top surfing competitions take place in the weeks before Christmas and it's a great chance to see how it's done. If you haven't tried surfing before, book a lesson with a local instructor. There are plenty of surf shacks on the main surfing beaches, where you can hire equipment and grab a lesson. Newbies are given longboards to practice with, so it shouldn't take you long before you are riding your first big wave. Pay close attention to warning signs on the beach. If there are signs telling you the surf is dangerous, don't ignore them. You're putting other people's lives at risk as well as your own. Unless you are experienced, it is wise to surf on a beach with a lifeguard present. Hawaii is so remote that you will meet some very unusual marine life below the surface. The waters around Hawaii are known for excellent visibility all year round. There are some world-class dive sites around the Hawaiian Islands. The Manta Ray Night Dive is one of the most famous. There are lights on the ocean floor, which attract huge quantities of plankton. This, in turn, attracts all kinds of marine life. Manta Rays feed on the plankton and they are unafraid of scuba divers. You can swim among the rays and marvel at their beauty. Dive the Sea Tiger, a sunken vessel full of marine creatures. You will see sea turtles, eagle rays, moray eels, and more. This one is for the more experienced divers. The Cathedrals at Lanai is a great wall dive. You can dive down up to 20 meters and explore caves and caverns. Small holes in the lava walls let light in, which creates a spectacular window effect. If you want to try a drift dive, head over to the Molokini Crater off the coast of Maui. The back wall area is home to dolphins, sharks, and manta rays. This dive site is best for more intermediate and advanced divers. Many of the top dive sites, including the Manta Ray Night Dive, are also suitable for snorkeling enthusiasts. In addition, travel out to Molokai and the Fringing Reef. You might enjoy the company of whales between December and March. Turtle Town on the south coast of Maui is famous for its resident sea turtle population. You can look but don't touch, as these amazing creatures are endangered. Kealakekua Bay State Park on Big Island is the place to go for a glimpse of Spinner Dolphins. You will also see reef sharks and sea turtles on your snorkeling adventure. Stand-up paddleboarding is a popular variation of surfing. Rather than riding a wave, you balance on your board and use a paddle to move along in calmer waters. It's not easy and you need good core strength and a sense of balance, but SUP is fun. If you are new to the sport, only try stand-up paddleboarding in the company of an experienced instructor. Your instructor will make sure you only head out on the water in an area where it's safe for a novice. There are dangerous currents and hidden reefs off some beaches. You also don't want to end up colliding with a surfer or scuba diver. SUP boards can be hired from beach rental stores. You can also book SUP tours with a guide. Take an eco-tour on a paddleboard and discover more about Hawaii's marine environment. Kayaking is a fun way to explore the coastline in the Hawaiian Islands. The Napali Coast is a quieter spot for adventurous kayakers. It takes approximately one day to kayak between Polihale State Park and Haena Beach Park, but the views are well worth your efforts. If you want to kayak inland, head to the Wailua River. The current is nice and slow, so it's perfect for beginners. It's also the only way into Uluwehi Falls, which is a perfect end to an idyllic trip. - Jet skiing – hire a jet ski or wave runner and have fun exploring the waters off-shore. Note: you will need a valid drivers' license to hire either of these machines. - Wakeboarding or waterskiing – adrenaline junkies will love this one. You can try wakeboarding and waterskiing in Koko Marina on Oahu. - Sailing - A bit more relaxing, but no less fun! Hawaii is a wonderful vacation destination. Book your flight today and make this a trip of a lifetime!